Bombastic Brewing does things differently. 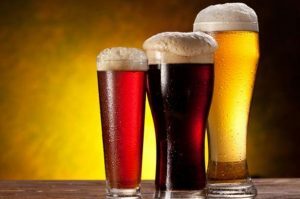 Its business model is unlike anything else we’ve seen, so far, in the Inland Northwest’s growing brewing industry. Production is small, beers are big and there’s no taproom for customers to grab a pint. The project started four years ago when Russell Mann, former owner of Post Falls wine and beer shop Enoteca, and Phil Hottenstein, a railroad engineer, formed a bond over their passion for all things beer. When the pair found a head brewer in Matt Skillicorn, a mechanical engineer and seven-year homebrewer, they knew they could make their beer-making dream a reality. Mann works the business side, Skillicorn makes the beer, Hottenstein helps brew and handles marketing. Between the three of them, they’ve sampled all types of beer across the United States and throughout Europe. Bombastic is currently brewing on an incredibly small (relative to most craft breweries) one-and-a-half-barrel system. The brewery usually isn’t open to the public, and its beers aren’t available in stores. Instead, the trio is taking a different approach. When a beer is ready for release, they package it in kegs and bottles. There’s a two-week online order window, offering a limited number of bottles for sale that are then distributed to purchasers on a specified pick-up date at the brewery, where the public can also sample the newest beer on tap. Buyers have to show up — or find a proxy — to the brewery on the specified date or their orders are forfeited. Hottenstein believes this online approach to sales is a better way of doing things. “It’s a more fair opportunity,” he says. 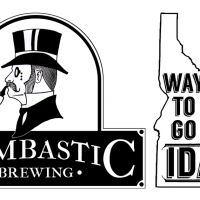 Bombastic’s bottles can occasionally be found at Enoteca, with a few kegs tapped at spots around the Coeur d’Alene area. Bombastic also stands out from the pack because it specifically specializes in high percentage alcohol by volume (ABV) beers. “We do big beers. We do very unique, exceptional beers,” notes Hottenstein. The Murder Imperial Stout, for example, is the brewery’s standard stout, coming in at 10 percent ABV with vanilla, cinnamon, cocoa nibs, cayenne pepper and ancho chilies. Their most recent release is called Aggravated Murder Imperial Stout, which was conceptualized after a night of drinking. At around 3 am, Hottenstein and Skillicorn began to craft the recipe. Then they slept for five hours, woke up and began brewing. “I wanted to make a really big stout,” Hottenstein recalls. The resulting 13.5 percent ABV imperial stout had maple syrup added to the boil, and cold-pressed DOMA coffee added after primary fermentation. 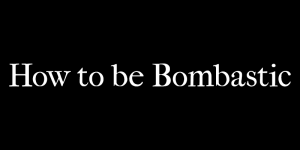 It stays true to Bombastic’s limited release model, with only 84 bottles packaged. 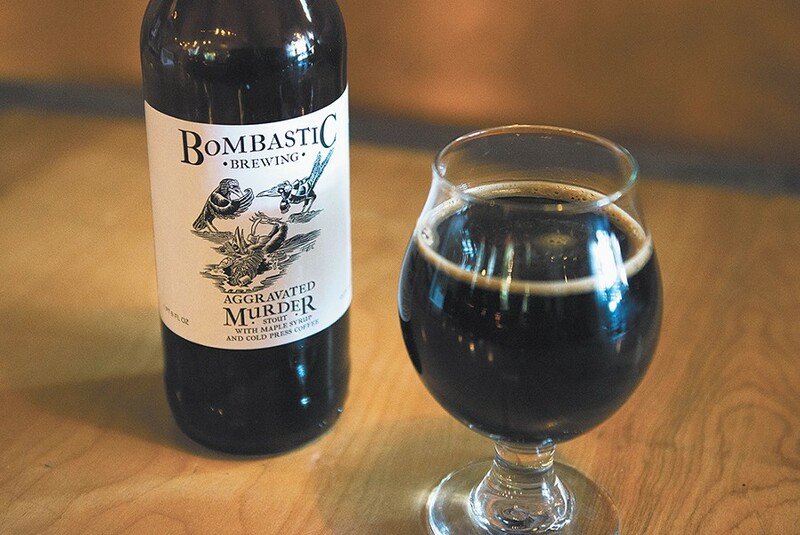 Aggravated Murder ($16) is currently available for online ordering, along with the base Murder Stout ($11) and Stubbornness ($16), a 12 percent ABV English-style barleywine. Order pickup is scheduled for this Saturday, Nov. 4, at the brewery. It’s no surprise that the guys behind Bombastic have some adventurous plans for the future. Their goal since the beginning has been to become a contract brewery — a form of brewing in which small-scale brewing operations rent underutilized space at other breweries to make their product. This business model has been used by breweries across the world, most popularly by Mikkeller (Denmark) and Evil Twin Brewing (New York City). The idea works like this: Bombastic approaches a local brewery that is not at production capacity. A contract is negotiated, allowing them to use the brewery’s space and equipment to brew their own beers under the Bombastic name. A nondisclosure agreement is signed and they get to work. The team also plans to expand distribution into Washington; Hottenstein expects a mid-2018 launch. Though there may not be anything else like it in the area, Hottenstein is a firm believer that Bombastic’s high-ABV, higher-priced beers are worth every penny. For more information about Bombastic Brewing’s online bottle ordering and events, visit bombasticbrewing.com.